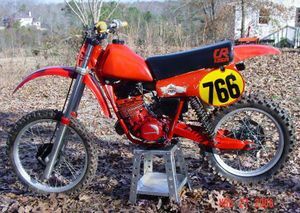 The successor to the Honda CR125M. 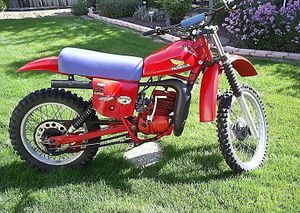 The CR125R'79 Elsinore was sold in 1979 in Tahitian Red. The engine was red; but the shock springs were black. The fork boots were black. The bike had a 23" front wheel and an 18" rear wheel. The engine was a 2-stroke reed valve single cylinder displacing 124cc linked to a 6-speed transmission. The serial number began JE01-2000010. 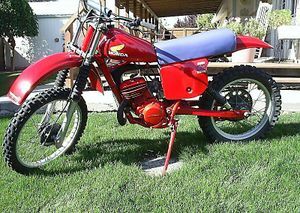 The CR125R'80 Elsinore was sold in 1980 in Tahitian Red. 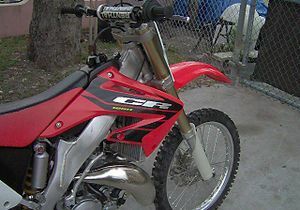 The "CR125R" logo on the side of the seat was red. The shock springs were red. The bike had a 21" front wheel and an 18" rear wheel. The gas tank was plastic. The fork boots were black. 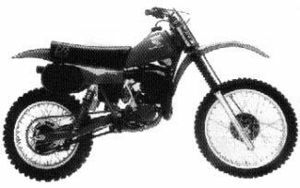 The engine was a 2-stroke reed valve single cylinder displacing 124cc linked to a 6-speed transmission. The serial number began JE01-2000010. 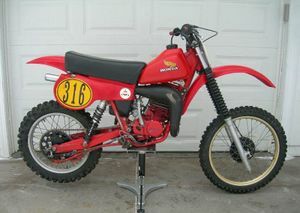 The CR125R'81 Elsinore was sold in 1981 in Tahitian Red with White. The gas tank shrouds were white. The engine was red. The number plate panels were black. 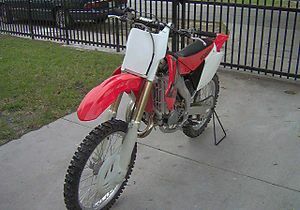 The seat was black with a white "125R" logo. The fork boots were black. The bike had a 21" front wheel and an 18" rear wheel. The gas tank was plastic. The bike featured a Pro-Link™ suspension. 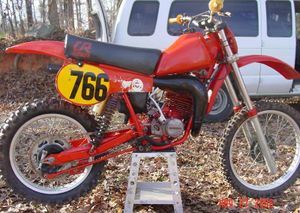 The engine was a 2-stroke liquid-cooled reed valve single cylinder displacing 123cc linked to a 6-speed transmission. The serial number began JH2JE010*BC2000032. 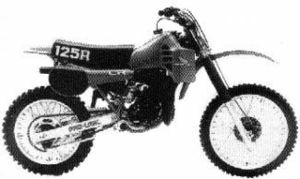 The CR125R'82 was sold in 1982 and was no longer called Elsinore. It came in Tahitian Red (the last year for this shade of red). 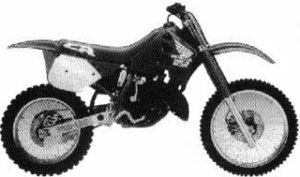 The seat was black with a white "125R" logo. The engine was black. The number plate panels were black. The fork boots were black. The front forks were 38mm. The bike also had a single leading shoe front brake. The bike had a 21" front wheel and an 18" rear wheel. The gas tank was plastic. 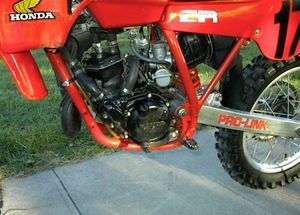 The bike featured a Pro-Link™ suspension. 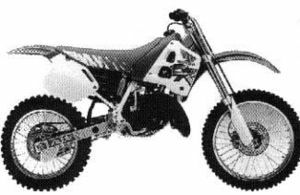 The engine was a 2-stroke liquid-cooled reed valve single cylinder displacing 123cc linked to a 6-speed transmission. The serial number began JH2JE010*CC3000001. 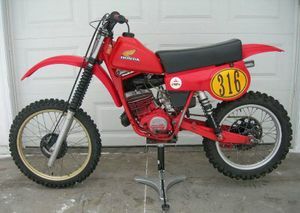 The Honda CR125'83 was sold in 1983 and was available in one color: Flash Red. The number plate panels were black. The seat was blue with a white "CR" logo. 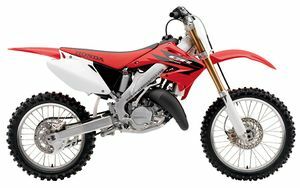 The "125R" swingarm decal was black. The engine was black. The fork boots were black. The front forks were 38mm. The bike also had a single leading shoe front brake. The bike had a 21" front wheel and an 18" rear wheel. The gas tank was plastic. The expansion chamber had an aluminum silencer. The bike featured a Pro-Link™ suspension. 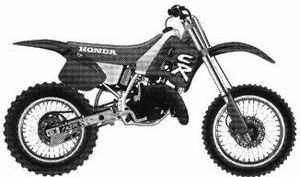 The engine was a 2-stroke liquid-cooled reed valve single cylinder displacing 123cc linked to a 6-speed transmission. The serial number began JH2JE010*DC400014. 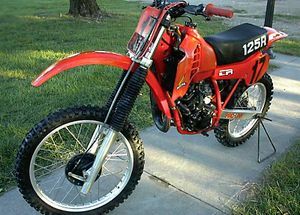 The CR125R'84 was sold in 1984 in Flash Red. 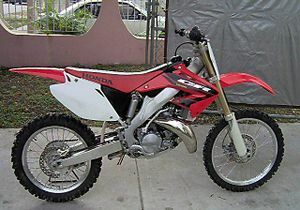 The "125R" swingarm decal was red and white. The number plate panels were black. The seat was blue with a white "CR" logo. The fork boots were black. The bike had a 21" front wheel and an 18" rear wheel. The engine was black. The gas tank was plastic. The bike had a hydraulic disc front brake. The expansion chamber had an aluminum silencer along with a new auto torque amplification chamber (ATAC). 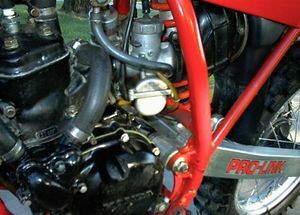 The bike featured a Pro-Link™ suspension. 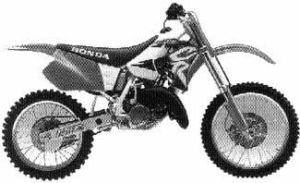 The engine was a 2-stroke liquid-cooled reed valve single cylinder displacing 123cc linked to a 6-speed transmission. 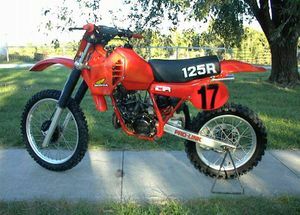 The CR125R'85 was sold in 1985 in Flash Red. 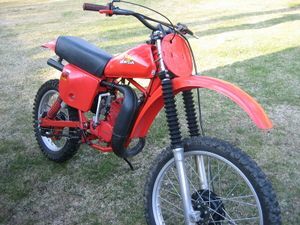 The "125" gas tank shroud decal was red and blue. The wing decal on the tank shroud was red, white, and blue. 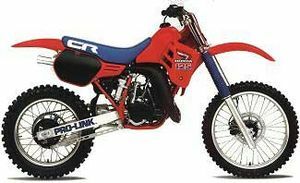 The "Pro-Link™" swingarm decal was solid blue. The seat was blue with a white "CR" logo. The number plate panels were black. The bike had a 21" front wheel and an 18" rear wheel. The bike had a hydraulic disc front brake. The gas tank was plastic. The engine was black. The expansion chamber had an aluminum silencer along with an auto torque amplification chamber (ATAC). The bike featured a Pro-Link™ suspension. 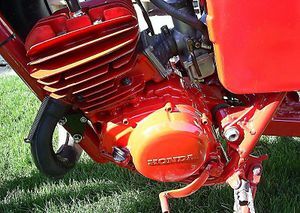 The carburetor was a flat-slide style. 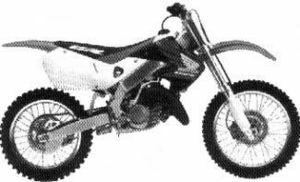 The engine was a 2-stroke liquid-cooled reed valve single cylinder displacing 124cc linked to a 6-speed transmission. The serial number began JH2JE010*FC6000001. 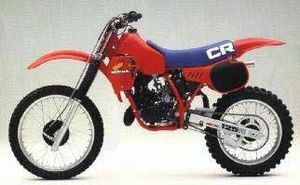 The CR125R'86 was sold in 1986 in Flash Red. 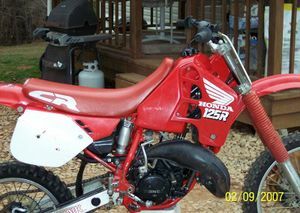 The "125" decal on the tank shroud was red with a white outline. The wing decal on the tank shroud was red, white, and blue. The seat was blue with a white "CR" logo in outline. 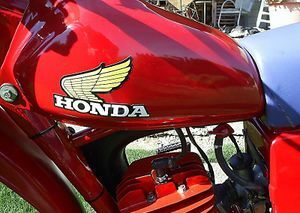 The "Pro-Link™" swingarm decal was a black outline. The engine was black. The number plate panels were black. The bike had a 21" front wheel and an 18" rear wheel. The wheel rims were gold anodized. The bike had a hydraulic disc front brake. The gas tank was plastic. The expansion chamber had an aluminum silencer along with an auto torque amplification chamber (ATAC). The bike featured a Pro-Link™ suspension. The carburetor was a flat-slide style. 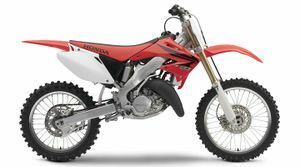 The engine was a 2-stroke liquid-cooled reed valve single cylinder displacing 124cc linked to a 6-speed transmission. The serial number began JH2JE010*GC7000001. 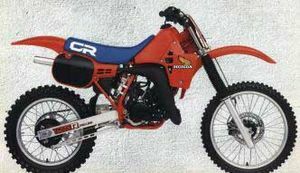 The CR125R'87 was sold in 1987 in Flash Red. The wing decal on the tank shroud was red, white, and blue. 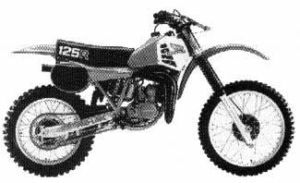 The "125" decal on the shroud was white. The seat was blue with a white "CR" logo. 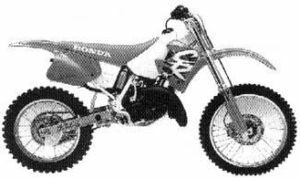 The "Pro-Link™" swingarm decal was a black outline. The engine was black. The number plate panels were black. The bike had a 21" front wheel and an 18" rear wheel. The wheel rims were gold anodized. The bike had a hydraulic disc front and rear brake. The gas tank was plastic. The expansion chamber had an aluminum silencer along with an auto torque amplification chamber (ATAC). The bike featured a Pro-Link™ suspension. 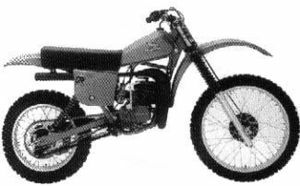 The carburetor was a flat-slide style. The engine used case reed induction. 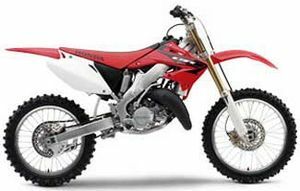 The engine was a 2-stroke liquid-cooled reed valve single cylinder displacing 124cc linked to a 6-speed transmission. The serial number began JH2JE010*HC8000001. 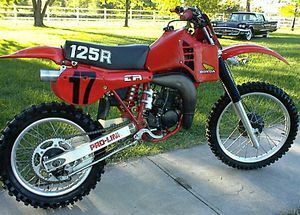 The CR125R'88 was sold in 1988 in Fighting Red. The number plate panels were white. 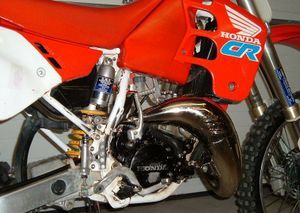 The "CR125" and wing decals on the tank shroud were white. The seat and fork boots were red. The engine was black. The bike had a 21" front wheel and an 18" rear wheel. The wheel rims were silver. The bike had a hydraulic disc front and rear brake. The gas tank was plastic. The expansion chamber had an aluminum silencer along with an auto torque amplification chamber (ATAC). The bike featured a Pro-Link™ suspension. The "Pro-Link™" decal had a red outline. 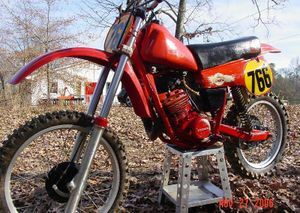 The carburetor was a flat-slide style. The engine used case reed induction. 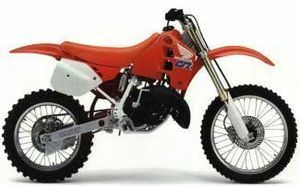 The engine was a 2-stroke liquid-cooled reed valve single cylinder displacing 124cc linked to a 6-speed transmission. The serial number began JH2JE010*JM9000001. 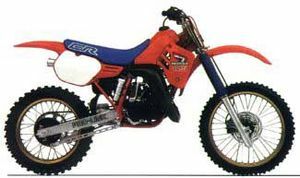 The CR125R'89 was sold in 1989 in Fighting Red. The new style wing logo appeared on the tank shroud. A "CR" appeared on the side of the seat. The engine was black. The bike had a 21" front wheel and an 18" rear wheel. The bike had a hydraulic disc front and rear brake. The gas tank was plastic. 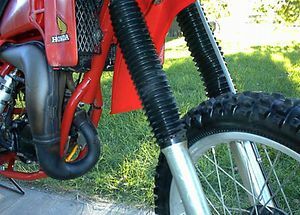 The low mount expansion chamber had an aluminum silencer. The bike featured a Pro-Link™ suspension. The engine had a Nikasil® plated cylinder. The serial number began JH2JE010*KM0000006. 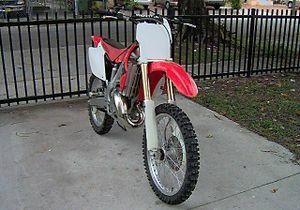 The CR125R'90 was sold in 1990 in Flash Red with Shasta White. The frame was Shasta White. The "CR" logo was blue with a white outline. The engine was black. The forks were inverted. The bike had a 21" front wheel and an 18" rear wheel. The bike had a hydraulic disc front and rear brake. The gas tank was plastic. The expansion chamber had an aluminum silencer. The bike featured a Pro-Link™ suspension. The serial number began JH2JE010*LM1000013. 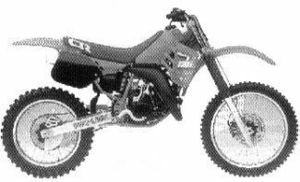 The CR125R'91 was sold in 1991 in Flash Red with Ross White. The frame was Ross White. The "CR" logo was white, yellow, and orange. The seat graphics were white. The "125R" logo on the swingarm was red. The side panels and rear fender had an integrated look. The engine was black. The forks were inverted. The bike had a 21" front wheel and an 18" rear wheel. The bike had a hydraulic disc front and rear brake. The gas tank was plastic. The expansion chamber had an aluminum silencer. The bike featured a Pro-Link™ suspension. The serial number began JH2JE010*MM2000008. 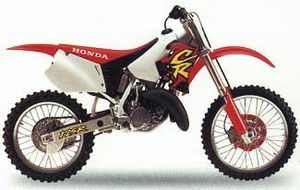 The CR125R'92 was sold in 1992 in Nuclear Red with Shasta White. The frame was Ross White. 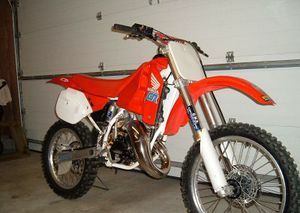 The gas tank and air box cover were Shasta White. The "CR" logo on the tank shroud was white with a blue outline. The bike had a 21" front wheel and an 18" rear wheel. The bike had a hydraulic disc front and rear brake. The forks were inverted. The gas tank was plastic. The expansion chamber had an aluminum silencer. The bike featured a Pro-Link™ suspension. The serial number began JH2JE010*NM3000006. 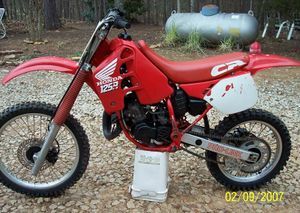 The CR125R'93 was sold in 1993 in Nuclear Red and Shasta White. 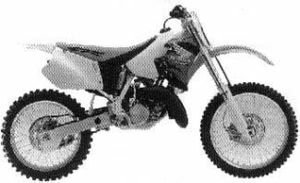 The bodywork was similar to the CR250R'93. The frame is chalk white. The red is a deeper red. The "CR" logo on the tank shroud was blue with a white outline. The bike had a 21" front wheel and an 18" rear wheel. The bike had a hydraulic disc front and rear brake. The forks were inverted. The gas tank was plastic. The expansion chamber had an aluminum silencer. The bike featured a Pro-Link™ suspension. The serial number began JH2JE010*PM4000010. 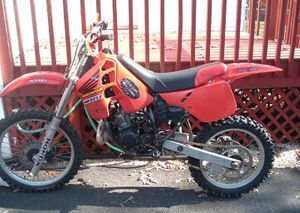 The CR125R'94 was sold in 1994 in Nuclear Red and Shasta White. The tank shroud had new fluorescent graphics. The frame was new with a different engine mounting location. The front suspension had inverted 43mm forks with new valving and seating. The handlebars were taller and wider. The bike had a 21" front wheel and an 18" rear wheel. The rear spokes were 4.5mm thick. The bike had a hydraulic disc front and rear brake. The gas tank was plastic. The expansion chamber had an aluminum silencer. 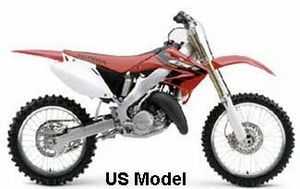 The bike featured a Pro-Link™ suspension where the swingarm was longer. The drive chain was now a #520. The serial number began JH2JE010*RM5000008. 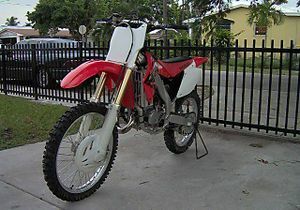 The CR125R'95 was sold in 1995 in Nuclear Red with Shasta White. The seat was blue. The radiator cowl was purple. The tank had new graphics. The suspension had Kayaba inverted forks. The gas tank was plastic. The rear wheel was 19". The front wheel was stronger. The bike had a hydraulic disc front and rear brake. The front disc had a protective cover. The expansion chamber had an aluminum silencer. The bike featured a Pro-Link™ suspension. The engine had improved response. The serial number began JH2JE010*SM6000001. 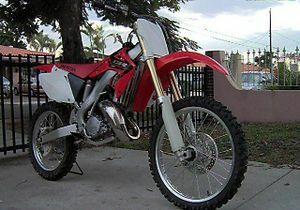 The CR125R'96 was sold in 1996 in Nuclear Red and Shasta White. The graphics were fluorescent. The suspension had 43mm inverted cartridge forks. The gas tank was plastic. The bike had a hydraulic disc front and rear brake. The expansion chamber had an aluminum silencer. 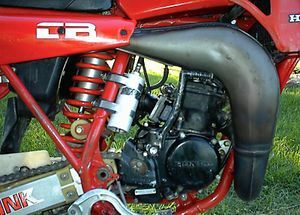 The bike featured a Pro-Link™ suspension. The serial number began JH2JE010*TM7000001. 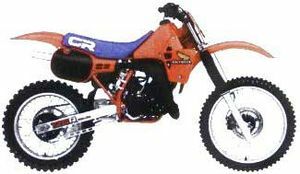 The CR125R'97 was sold in 1997 in Nuclear Red. The logo was redesigned. The lower fork guards were white. The "CR" logo on the seat was black. The gas tank was plastic. The bike had a hydraulic disc front and rear brake. The expansion chamber had an aluminum silencer. The bike featured a Pro-Link™ suspension. The serial number began JH2JE010*VM8000001. 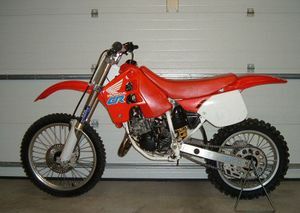 The CR125R'98 was sold in 1998 in Nuclear Red with Ross White. The bike had a new twin spar aluminum frame. The logos were redesigned. The gas tank was plastic. The bike had a hydraulic disc front and rear brake. The expansion chamber had an aluminum silencer. The bike featured a Pro-Link™ suspension. The transmission was now a 5-speed. The serial number began JH2JE010*EC5000001. Rear suspension: Pro-Link Kayaba single-shock with spring-preload, 18-position (low- speed) and 2-turn (high-speed) compression-damping and 30-position rebound-damping adjustability; 317mm (12.5 in.) travel. This page was last edited on 10 December 2010, at 02:04.